Momma Told Me: With my own 2 hands. For the better part of a decade, of my childhood, I was enamored with craft projects and creative kits. I must have patiently colored over a dozen full size fuzzy posters (you know the ones with the black velvet printed on white paper? ), and painted enough clay pottery to open my own booth at the local craft fairs. Of course, this came from my desire to emulate Momma, who always came across, in my eyes, as a Jack of All Trades, and creative Wonder Woman. She was constantly jotting down craft ideas from HGTV shows and parenting magazines. There was always a project underway in our house, and usually more than one. Can you imagine if Momma had had Pinterest when I was a child? Sabrina (10) is much more mellow than I was at her age. She can sit on the couch and watch Netflix for 8+ hours without a single complaint of being bored. Regardless, she does enjoy actually doing something much more; I simply have the option whether to entertain or not. We're just about through Spring Break- Monday next week happens to be a 'staff day,' so we will be indulging in a movie (The Croods) at a local luxury theater where all seats are recliners and waitstaff serves gourmet food and sundaes at your set! But that is merely a reward for a very active Spring Break. I'll be sharing more of our baking and Clay-work endeavors in the upcoming week, but today is about another wonderful Orb Factory product. It's my personal believe that creative projects, and do-it-yourself crafts are especially important to a child's development. There are many categories of creative (from baking or gardening to literally painting and building), and each child is certain to have their own niche. The constant in this is that all children desire pride, attention, and praise. An understanding of patience and accomplishment is something I see some of Sabrina's classmates lack. And it's a shame, really, because every child deserves their painting to be stuck on the fridge. 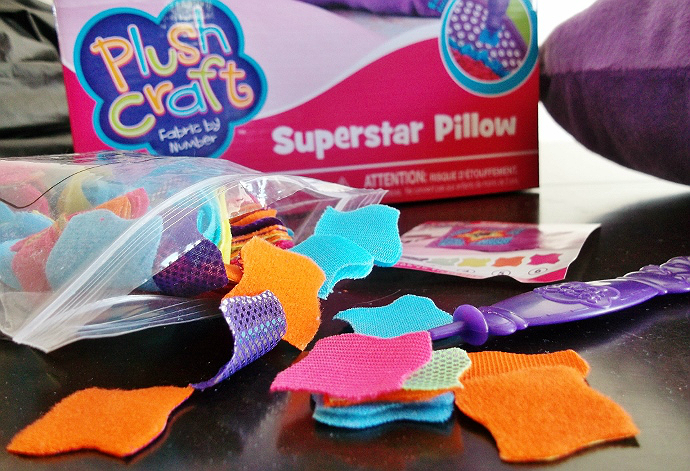 Whether the creative outlet is structured, like the Orb factory Plush Craft Superstar Pillow, or a free form craft, the key is to celebrate the end result. While many parents may feel inclined to 'jump in' and steer the child to a more aesthetic, or 'natural' approach is is essential we remain guides and not take over the actual project. Remember, children learn from mistakes just as much as they do from their success! 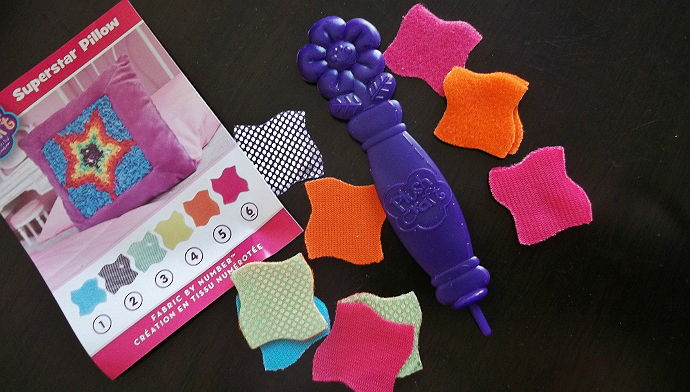 This Plush Craft project is considered suitable for children 5+, and may even double as a colors lesson for the younger crowd, with a color-by-number approach to fabric pushing. While Sabrina acted overwhelmed at the site of all the little fabric pieces, and a new concept, this was quickly thrown aside as she snatched the pillow and rubbed it against her face exclaiming how soft it was. 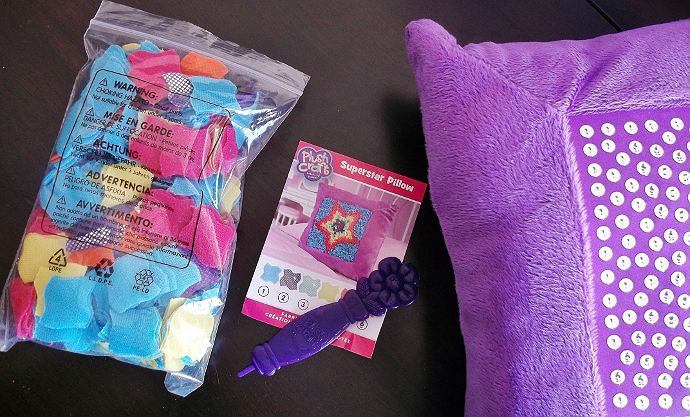 As an adult, I love the Plush Craft line because it is ready out of the box for engaging interaction. No additional materials are needed. There is no sewing, sharp or pointy tools, and Orb Factory includes ample additional fabric squares to account for lost pieces and accidents. While there is a star pattern worked into the number guide, one could theoretically create any design they wanted. 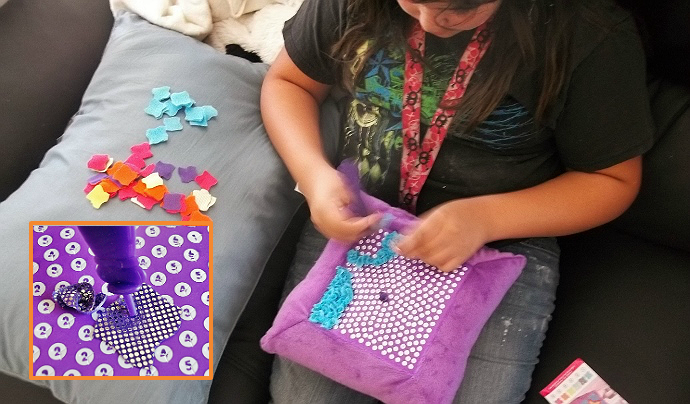 Designing the Superstar Pillow is as easy as matching a fabric square to a number then using the included plastic push tool to force a small nub through the center of the fabric into a pre-notched hole. When the stylus is then removed the fabric square has been notched into the guide and is securely held in place. The only downfall with this craft is that it should be done in a single event/location, as the small fabric pieces can and will blow off, or end up stuck to the dog, etc. I particularly enjoyed how focused and engaged Sabrina (10) was during the project, which took her about 25 minutes. And that was 25 minutes of cartoon free, silence; which was golden enough for me! Of course Sabrina was ultimately proud of completing the project entirely on her own, and happily showed the pillow of to anyone who would give her an audience. We can't wait to go shopping for our next Orb Factory product! What Daughter Says: Foster confidence and pride in your children with guided Orb Factory crafts. 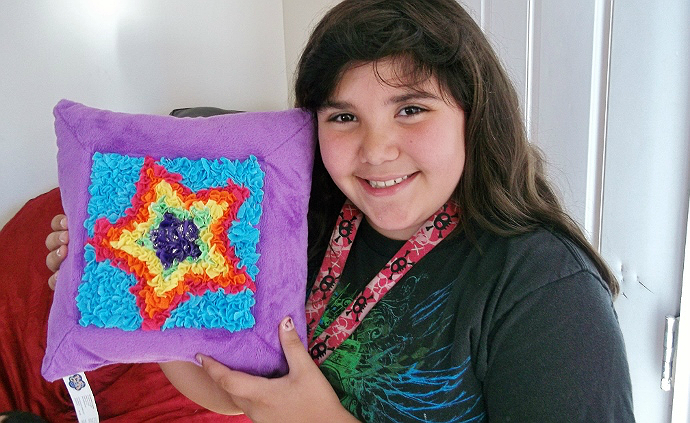 One Momma Told Me reader will win an Orb Factory Plush Craft pillow kit. I'd like to have your review the glitter chalk. Looks like something my daughter would really like. Love the pillow craft too! That is such an adorable craft! So cute. The Lava Rock Volcano would be a huge hit with all my kids. My kids would love the sticky mosaics. We are always looking for neat art projects. Loved how the pillow turned out! My daughter would love the sticky mosaics. That project with your daughter turned out so cute! The glitter chalk looks awesome! It would be great if you featured the Pulsar Powerballs™. I'd love to see you review the Stick 'n Style Sparkle Shades. I would love a review of Curiousity Kits. I"d like you to review the Sticky Mosaics. My daughter would love the Sparkle Ups Fairies! the decoupage jewelry looks fun! I like the Fancy Nancy Fancy Jewelry Box!